Sleep deprivation and stress can be a vicious cycle. We often have trouble falling sleep because we're worried and anxious, and in turn, the fact that we didn't get enough sleep makes us stressed the next day. According to a recent Huffington Post survey, sleep deprivation is a major source of stress among U.S. adults. That's where yoga comes in. By lowering stress levels, calming the mind and relieving tension in the body, the soothing practice can be an effective natural sleep remedy. Certain resting and inversion poses can be particularly helpful for combatting restlessness and insomnia, especially when practiced in the evening or in bed before hitting the hay. "We live in such a fast-paced environment and our senses are always being stimulated, and that affects our nervous system," says Vyda Bielkus, a yoga teacher and trainer and founder of Health Yoga Life. "The yogic technique of focusing on your breath can be helpful -- the exhalation stimulates the nervous system to release ... [and] the poses also help us relieve tension from the physical body." Bielkus notes that many of her students report that taking a class in the evenings helps them sleep better. But if you can't make it to the studio after work, try these 10 relaxing poses at home to help you get a good night's rest. To perform this pose, stand with the feet about six inches apart and fold the torso to the ground, reaching toward the ground or bending the arms and grabbing opposite hand to opposite elbow. 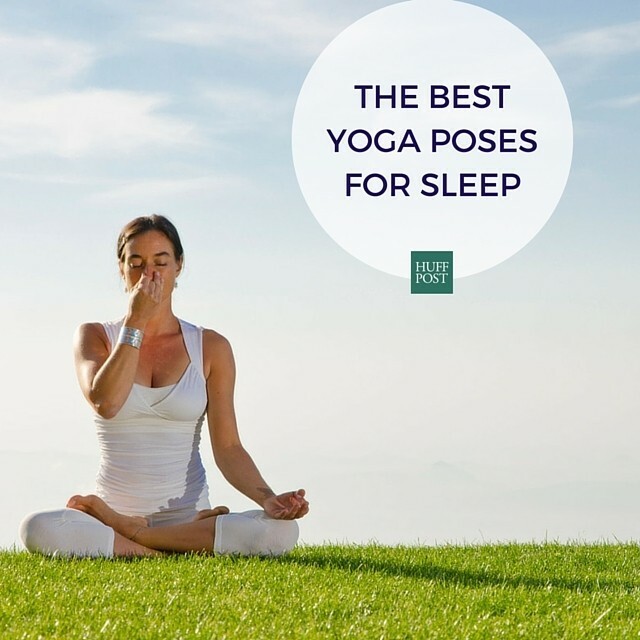 In addition to helping to relieve headaches and insomnia, the pose can also be helpful for lowering stress levels, according to Yoga Journal. "Sway a little side to side and breathe," says Bielkus. "Bend the knees as much as needed to ease any strain. Tension in the legs and hips will start to release." Yoga Journal recommendsstaying in the plow pose for one to five minutes to fall asleep easier. Lie down on your back, lifting your legs over your head and then to the ground behind you, with your hands either on your back for support or on the floor. "By turning the flow of blood around, you bring new vitality into the body," says Bielkus. This simple pose, performed against a wall, is excellent for evening relaxation and stress relief. Bielkus recommends staying in the pose for as long as five minutes, with the eyes closed and using a soothing eye pillow if desired. "When we flip the legs up, the blood can rush back down to the heart," says Bielkus. "It has a soothing quality." Get your body into sleep mode with a simple corpse pose, focusing the attention on the body and breath, and letting go of the day's worries. "By focusing the mind and bringing awareness in, you take the mind off of what is causing stress or restlessness," says Bielkus. This reclining twisted pose can easily be performed in bed before you fall asleep. Lie down on your back and bring the right knee into your chest and then across your left side. Extend the right arm out and gaze to the right, taking several deep breaths and then repeating on the other side. You can also try bringing both legs up and then over to each side, as pictured above. "Gentle twists relieve tension throughout the whole spine and also aid in digestion and help us rinse out some tension from the day," Bielkus says. Like the supine twist, the seated spinal twist (also known as the half lord of the fishes pose) can create a sense of relaxation in the body while gently stretching the spine. The stretch can be practiced with both legs bent or with one outstretched. A variation of the basic butterfly pose, pictured above, the reclining butterfly can help the body get into rest mode. Lie down on your back -- on your bed or on a mat -- and bring the feet together, splaying out the knees in a diamond. If your hips are tight and the pose feels too intense, Bielkus suggests putting a folded blanket or cushion under each of the knees. "Bring one hand to your heart and one hand to your belly," Bielkus says. "Breathe deeply observing the breath move in and out of the body." To try this relaxing breathing exercise, or pranayama, you can either sit up crossed-legged or lie down on your right side. Cover the right nostril with your thumb and extend the fingers out. Then take five to 10 deep breathes out of your left nostril. "If I can't sleep ... As soon as I've done three left nostril breaths, I'm out," says Bielkus. "It's really, really effective."